Flying Trapeze is appropriate for people of all ages, abilities and skill levels. You don't have to be a flexible gymnast to participate. If you can hang static from a bar for 20 seconds, than you can do this. Afraid of heights? Most people are. The comment we get most frequently is "I can't do that, it's too high". Conquering our fears begins with the acknowledgment that oftentimes fear is a decision. Trapeze is a safe activity to help you overcome and embrace your fears. We offer occasional classes for beginners as well as group events, team building and parties. We look forward to soaring with you soon and hope you will enjoy flying on the trapeze as much as we do. 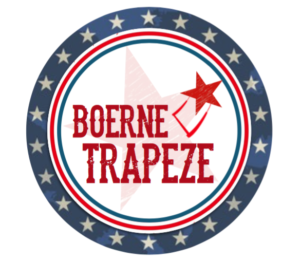 Boerne Trapeze is owned and operated by the Labat family. Wayne and Lisa met at a trapeze rig in San Diego. After being friends for a few years we one day decided to put together a partner trapeze routine…. and let’s just say the partnership worked out better than either of us ever imagined it would. One thing led to another and here we are in San Antonio with a beautiful home, two awesome kids and a trapeze in our backyard - well soon to be behind Boerne Gymnastics! Both of us are believers in the transformative power of circus in people’s lives and want to share that gift with others. Lisa is the professional in the family. She went to Club Med on vacation one summer, discovered flying trapeze, and literally did not leave when her vacation was over. She remained at Club Med for the rest of the season working and performing. From there she continued her flying career with several flying troupes with whom she performed for Cirque du Soleil, Circus Circus, Silvers’ Circus and more. She was also featured in the circus documentary and series Catching Dreams. When she attempted to leave her full time performance career, she landed in NYC where she became director of PARTYpoopers, a premier party planning agency in NYC. Then Cirque called and Lisa couldn't say no, so she joined them for a bit and ended up settling in San Diego, where she ran the San Diego PARTYpooper operation, as a side gig. In California, she continued to fly and then became the manager at Trapeze High . Lisa and Wayne, both helped to start, and were on the board of Directors, for a non-profit called Circus Fund, a circus school for underprivileged kids. Lisa also managed the Ashtanga Yoga Center. Her love of Yoga has led her to share what she knows. She currently teaches at Lifetime Fitness and occasionally at Yoga Shala. Wayne is a Naval Officer and renaissance man who discovered flying trapeze at Trapeze High while stationed in San Diego. Despite coming to aerial arts later in life, he has always been something of a performer. He was a die hard thespian in high school and learned both the stage and technical side of theatre at the New Orleans Center for the Creative Arts. Outside of theatre he picked up other skills throughout his early life: he was a competitive fencer, juggler and fire eater who studied several martial arts forms. He also was a dedicated photographer and learned his way around the dark room (where you used to have to develop film in those ancient pre-digital days.) During his pre-circus days in San Diego he was an Ironman triathlete and mediocre surfer. Then he discovered Trapeze High- he went for a beginner class and basically never left. They eventually taught him how to catch and pull safety lines and paid him to be there. 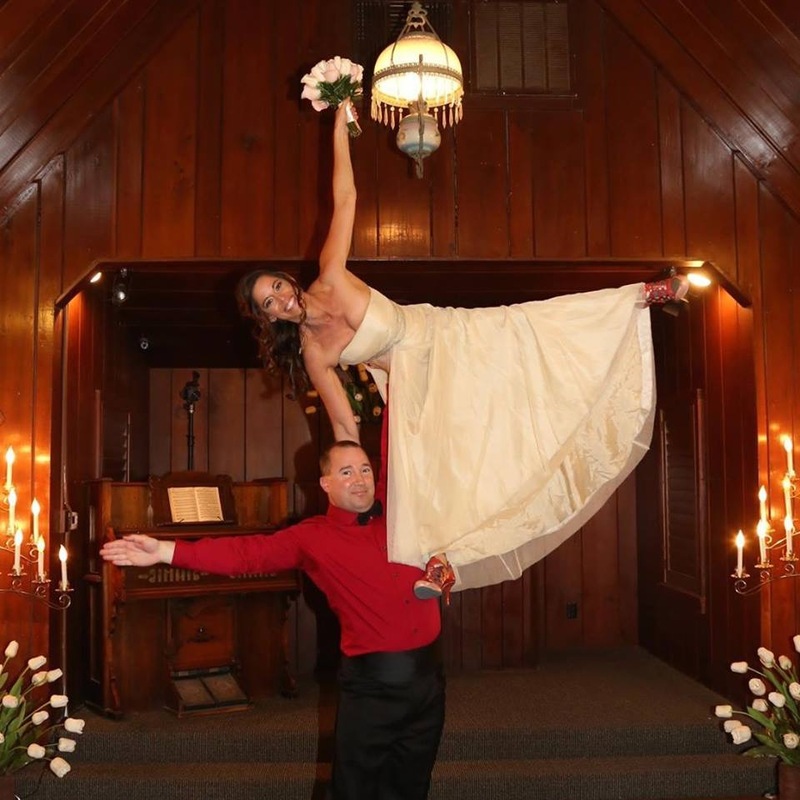 Through connections made there, he branched out and started learning other disciplines including silks, static trapeze and partner acrobatics and was a performer and instructor with Aerial Revolution.